Occunomix is one of the world’s leading designers and manufacturers of OSHA approved personal safety equipment. 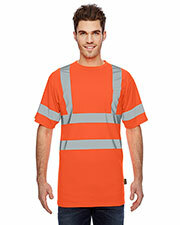 Gotapparel.com is proud to offer OccuNomix’s high visibility vests, shirts, and jackets at discounted wholesale prices, all of which meet the ANSI 107-2010 standard. As such, all of Occunomix high visibility vests and jackets are made with high quality materials for proven durability. With high visibility vests, shirts, and jackets available in all sizes, you can be confident in safety on the job while working in hot or cold environments, as well as, other possible discomforts. High visibility vests, shirts, and jackets have been proven to reduce accidents and injuries to work crews and pedestrians in broad daylight, lowlight, and inclement weather conditions the world over. If drivers are able see workers and pedestrians from farther away there is more of a reactionary gap, meaning that an accident can be avoided much earlier as opposed to the last second. The reason this is possible is because high visibility vests, shirts, and jackets are made in an ultra-bright color with a reflective material that reflects light back to its source. Wear high visibility vests, shirts, and jackets over short sleeve t-shirts, long sleeve t-shirts, or other work wear and top it off with comfortable headwear.